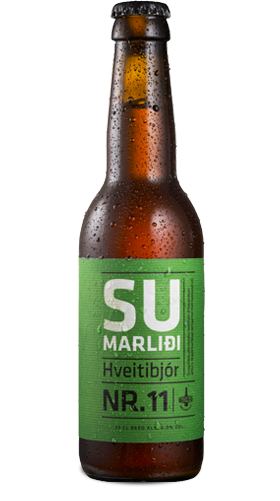 Sumarliði (Old Norse for “summer-farer”) is the first German style wheat beer produced and sold in Iceland. The origin of this distinguished beer style can be traced to Bavaria where it is known as Hefeweizen and was once the sole privilege of Bavarian royalty as general production of wheat beer was banned under the German purity law. Sumarliði is an unfiltered, joyful lad and an entertaining drinking buddy, arriving along with the summer sun with bananas, cloves, a flowery aroma and promises of brighter times ahead. Ingredients: Water, malted wheat, malted barley, hops and yeast.